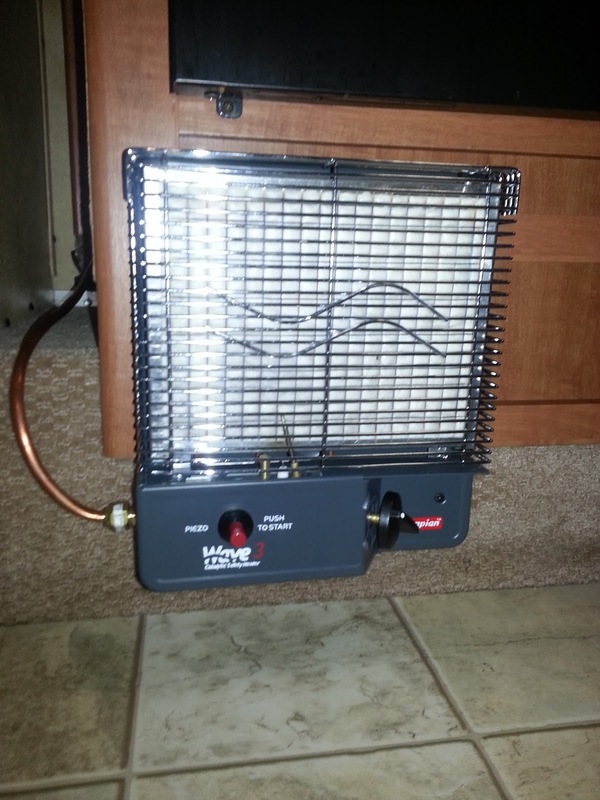 The biggest drain on our battery when we are boondocking is using the RV furnace to heat our camper. We often talked about how much better off we would be if we didn't have to run the heater. We tried toughing it out and turning the thermostat way down low, but those middle-of-the-night calls of nature were getting to be pretty uncomfortable and that is the reason we USE an RV instead of tent camping isn't it? It didn't take long to do some research and see what others use for heat that doesn't drain the battery: Catalytic heat. It's a propane-powered unit that uses very little propane and NO battery at all. It's very safe too, even though it does take some getting used to. If you have a functioning LP detector in your RV (and you should) there should be no concerns after a proper installation. We installed ours ourselves after watching the very helpful video put out by Trailer Life HERE. The heater does not have a thermostat (it's only downside) but does offer a "low"and "high"setting. We haven't put ours to use yet, as it is newly installed for our "big trip" but we will keep you posted. If you get just a little too warm on the "low" setting, then you can crack open a window. Not a bad way to go, because this helps get rid of excess moisture buildup in the RV when you are indoors a lot with the furnace on. Todays RVs are pretty air-tight and everyone benefits from a little fresh air. 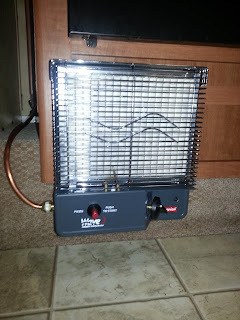 We installed the Camco Olympian Wave-3 Heater, and purchased it from Amazon.com. We don't have a lot of square footage to heat, so we feel the smallest model will suffice. You can either install it by hanging it on the wall in an appropriate place (the video above talks about placement) or you can purchase the legs to set it on. We purchased the legs, but opted not to use them because of safety reasons. Our local RV shop said they would not do an installation inside of an RV with a "soft hose" propane connection and that it was illegal. We decided that it was likely that this was for a reason and hard-plumbed the unit in. We also purchased the dust cover because of all the reviews we read, getting the glass mat dusty would render it useless and it is costly to replace. The dust cover is only about $19 and we feel, good insurance. They make two versions, one for a freestanding model and one for a wall-mounted model.